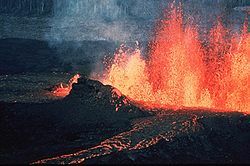 A volcano eruption is the release of stored energy from below the surface of Earth. The heat comes mostly from radioactive decay, and convection, in the Earth's core and mantle. Earth science is an all-embracing term for the sciences related to the planet Earth. Earth science may also be called geoscience. It is a broader term than geology because it includes aspects of planetary science, which is part of astronomy. The Earth sciences include the study of the atmosphere, oceans and biosphere, as well as the solid earth. Typically Earth scientists will use tools from physics, chemistry, biology, chronology and mathematics to understand the Earth, and how it evolved to its current state. If there is one fact which underlies all Earth science it is this: the Earth is an ancient planet which has been changing the whole time since its formation. The extent of the changes is much greater than people used to think. The Ordovician–Silurian boundary, an example of marine transgression as exposed on the Southern tip of the Hovedøya island, Norway. Due to the folding of the Caledonian mountain range, the layers have been inverted, leaving Ordovician granular limestone on top of the later Silurian brownish mudstone. Geology describes the rocky parts of the Earth's crust (or lithosphere) and its historic development. Major subdisciplines are mineralogy and petrology, geochemistry, geomorphology, paleontology, stratigraphy, structural geology, engineering geology and sedimentology. Geophysics and Geodesy investigate the shape of the Earth, its reaction to forces and its magnetic and gravity fields. Geophysicists explore the Earth's core and mantle as well as the tectonic and seismic activity of the lithosphere. Soil science covers the outermost layer of the Earth's crust that is subject to soil formation processes (or pedosphere). Oceanography and hydrology (includes limnology) describe the marine and freshwater domains of the watery parts of the Earth (or hydrosphere). Includes Marine biology. Glaciology covers the icy parts of the Earth (or cryosphere). Atmospheric sciences cover the gaseous parts of the Earth (or atmosphere) between the surface and the exosphere (about 1000 km). Major subdisciplines are meteorology, climatology, atmospheric chemistry and physics. Closely related to the earth sciences are physical geography and biology. ↑ Encyclopedia of Volcanoes. Academic Press, London, 2000. ↑ Van Andel, Tjeerd 1994. New views on an old planet: a history of global change. 2nd ed, Cambridge University Press, Cambridge UK. ↑ Adams, Simon & Lambert, David 2006. Earth Science: an illustrated guide to science. New York NY 10001: Chelsea House. ISBN 0-8160-6164-5. ↑ 5.0 5.1 Smith, Gary A. & Pun, Aurora 2006. How does the Earth work?. Pearson Prentice Hall, NJ. ISBN 0-13-034129-0. This page was last changed on 2 August 2013, at 06:23.